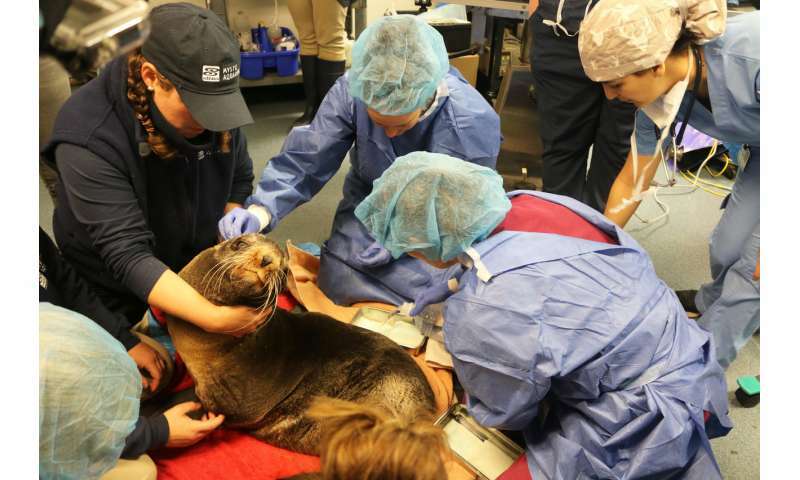 Veterinarians from Cummings Veterinary Medical Center at Tufts University and Mystic Aquarium prepare Ziggy Star, an adult Northern fur seal, for brain surgery. Credit: Mystic Aquarium. A neurosurgical team at Cummings School of Veterinary Medicine at Tufts University has successfully performed what is believed to be a first-of-its-kind brain surgery on a Northern fur seal named Ziggy Star in an attempt to address her worsening neurologic condition. Ziggy, an adult female, is recovering well at her permanent home at Mystic Aquarium in Mystic, Connecticut. "The ability to successfully complete this procedure with many unknown factors is due in large part to the collaboration among colleagues at Cummings and Mystic," said Cummings lead neurosurgeon, Ane Uriarte, DVM, Diplomate of the European College of Veterinary Neurology. "The combined expertise and skills from all our areas of specialty—from neurosurgery to anesthesia and zoological medicine—was critical to this success." Ziggy was first seen at the Henry and Lois Foster Hospital for Small Animals at Cummings Veterinary Medical Center at Tufts University in September for a condition that had progressed over several years and was causing severe neurologic episodes, difficulty moving, reduced training response, and cluster seizures. An MRI revealed an accumulation of cerebral spinal fluid in the brain, a condition known as hydrocephalus. Mystic Aquarium took in Ziggy approximately four years ago after she was found stranded on the California coast and deemed non-releasable by the federal government. At the time, she had an MRI that showed some neurologic abnormalities. She received treatment, but her symptoms continued to progress at a concerning rate, with the seizures emerging more recently. "The MRI taken recently by our team showed that the brain was disappearing due to the excess fluid, and it was significantly worse than the last study four years ago," said Uriarte. "After discussion with Mystic's veterinary team, we determined the best option to prevent further deterioration of the brain and to improve Ziggy's symptoms was to surgically place a shunt to drain the excess fluid, relieving some of the pressure on the brain." While this surgical procedure could not reverse damage caused to the brain by excess fluid, if successful, it could stop the progression of Ziggy's condition, improving her quality of life, level of responsiveness and mobility. Though hydrocephalus is a fairly common condition in cats and dogs, veterinarians were unable to find documented cases of this particular disorder being surgically managed in pinnipeds—seals, sea lions and walrus. With no published research or documentation on similar procedures in pinnipeds, they relied heavily on their experience treating the condition in other animals, combined with extensive review of the skeletal structure of the fur seal to determine where to enter the skull and place the shunt. The team present on the day of the surgery, conducted Nov. 20, included veterinary anesthesiologists, neurosurgeons and zoological medicine specialists from Cummings Veterinary Medical Center, as well as zoological medicine specialists from Mystic Aquarium who serve as Ziggy's primary veterinarians. Ziggy's trainers were also present, who helped to keep her calm and comfortable throughout transport and recovery. A boarded anesthesiologist who specializes in marine mammals was brought in by Mystic Aquarium as well. A marine mammal's "dive reflex" can often lead to alterations in heart rate, blood pressure, and respirations when under anesthesia, which can make anesthesia more challenging than with a dog or a cat. The surgical procedure, which lasted a little over an hour, involved placing a shunt catheter - a narrow tube—through the skull and into the brain. The catheter was then positioned underneath the skin through the neck and passed down to Ziggy's abdomen. A valve controls the flow of excess cerebral spinal fluid from the brain to the abdomen, where it is absorbed by the body. Post-surgery, the veterinary team confirmed that the shunt was placed correctly via CT scan. Ziggy had a slightly prolonged recovery after the procedure due to seizure activity that was successfully managed. She was transferred back to Mystic Aquarium on Nov. 21 once she was in stable condition. Foster Hospital's Medical Director Virginia Rentko, VMD, Diplomate of the American College of Veterinary Internal Medicine, added, "It's exciting to see our team translate their skills and experience in the treatment of such a unique patient. Taking on these challenging cases is an essential part of advancing veterinary medicine." Ziggy is currently living in an off-exhibit habitat at Mystic Aquarium, where she is being monitored through her recovery and rehabilitation. "We continue to monitor Ziggy very closely," said Jen Flower, DVM, MS, Diplomate of the American College of Zoological Medicine, Chief Clinical Veterinarian at Mystic Aquarium. "She is showing marked progress daily; eating a full diet; moving well within her habitat and showing normal swim patterns. No additional seizures have been noted post-operatively."